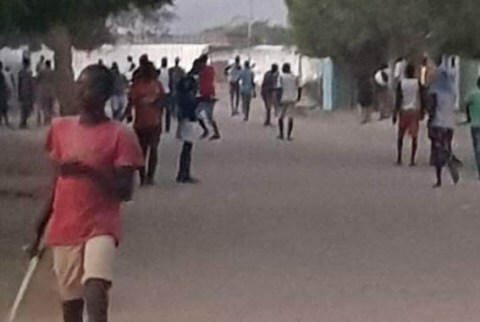 Anti-riot police in Chad have used tear gas canisters to disperse a demonstration by angry youths demanding an end to an indefinite teachers' strike. The demonstrators had gone on the rampage on Saturday morning, damaging public property and burning tire on public roads. According to witnesses, detachments of the mobile police intervention group (GMIP) deployed at the scene arrested several demonstrators, some of whom put up fierce resistance. Launched by the National Union of Chadian Students (UNET), the demo named “Tintamarre” was intended to make as much noise as possible to draw the government’s attention to the desire of the youth who are desperate to go back to school and universities. The schools have been closed for two weeks as part of a general strike by civil servants. Whistles by youths beating saucepans sounded in neighbourhoods of the capital N’Djamena early on Saturday. The protesters later took to the streets of the capital burning car tires and ransacking public property, prompting stiff reaction from the police. During a meeting with the UNET on Friday, Higher Education minister, Adrien Malo, attempted to stop the demo by announcing the disbursement of three months of scholarship arrears. UNET president, Guelem Richard said Operation Tintamarre was not related to scholarship but was instead a statement to the government to find a lasting solution to the general strike by teachers.